Strengthen your students' vocabulary and grammar! This highly popular workbook uses the same vocabulary they've learned in their basal texts to review and thoroughly practice essential grammar taught in intermediate through advanced courses. Address the history, art, music, literature, science, and technology of the French-speaking world with four culture chapters. Following each chapter is a short self-test of the material covered. Provide practice of all the grammar topics that your students should know with exercises that are contextualized with French instructions. These help set the scene and prepare students for the task at hand. Bridge grammar practice and communication by emphasizing authentic language use and providing a cultural context for its structural exercises. 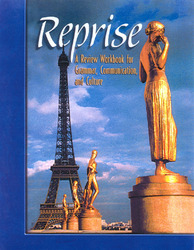 Reprise is practical, inviting, and easy to use. Help your students acquire knowledge that increases their confidence in using French to express their own thoughts, to comprehend those of French speakers, and to communicate in both speech and writing.